Asia and Australia rang in the new year today, welcoming 2012 in a riot of colour. Take a look at the latest pictures inside. IF YOU’RE ONE of our readers living anywhere in Asia or Australia, happy new year! 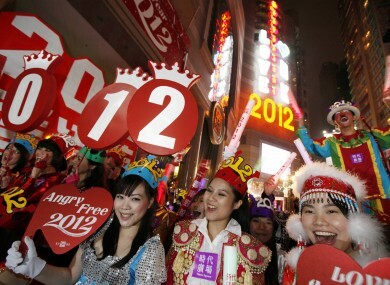 2012 has already begun in countries like Australia, Japan and Samoa, and the pictures of their colourful celebrations are just emerging now. Sydney saw spectacular fireworks, which had the theme of Time to Dream, and was produced by Aneurin Coffey. Around a million people gathered at Sydney Harbour Bridge, where they were entertained by wild animal noises and pop music as well as fireworks reflecting clouds and rainbows. The mood was festive in the South Pacific island nation of Samoa, where, for once, revelers were the first in the world to welcome the new year, rather than the last. Samoa and neighboring Tokelau hopped across the international date line at midnight on Thursday, skipping Friday and moving instantly to Saturday. For Japan, 2011 was the year the nation was struck by a giant tsunami and earthquake that left an entire coastline destroyed, nearly 20,000 people dead or missing and the Fukushima Dai-ichi nuclear power plant in meltdown. In Tokyo, the BBC reports that people released helium baloons with notes listing their 2012 hopes, wishing for a better year ahead. Email “It’s 2012! Australia and Asia ring in the new year”. Feedback on “It’s 2012! Australia and Asia ring in the new year”.